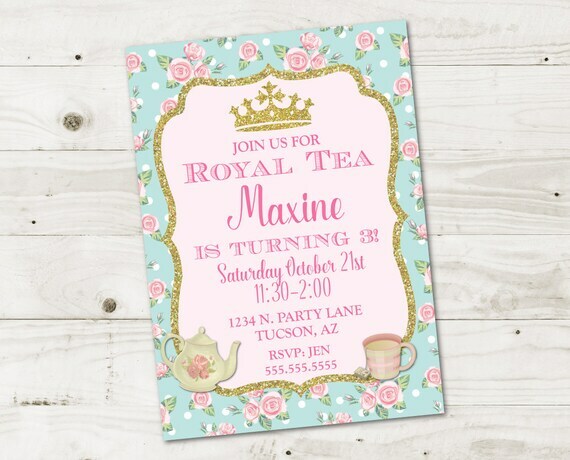 The Printable 5x7 Princess Tea Party Invitation is a cute an affordable addition to your child's party. ♦ Turnaround time for personalized orders is 1-2 business days (M-F) from time of purchase. If you need your item in a shorter period of time, please contact us PRIOR to ordering. ♦ Completed file will be emailed to the email address on file with ETSY unless a different address is left in the notes to seller. ♦ JPEG File: Print at home on 5x7 cardstock or photo paper. ♦ PDF File: Print at home on white letter sized (8.5"x11") card stock. File will print (2) 5x7 invitation per page. ♦ You may also print at the professional printer of your choice. Please Note: Some professional print shops will refuse to print digital items for possible copyright violations. Although these images are original works of clipart and not subject to copyright, I cannot control the printers decision to not print due to possible copyright conflict. If this occurs, I am happy to provide a copyright release form upon request or you may try a different print shop. These items can also be printed at home to avoid any possible issues. ♦ The price for the listing does not include any changes to design, colors, etc. If you would like any changes made, please contact me PRIOR to ordering to discuss details and pricing. ♦ Please review all shop policies before ordering. Because of the digital nature of our products, no refunds can be issued once the product(s) have been delivered.